Information : Builders | Sovereign Security Inc., & Sovereign Home Electronics, Inc. Sensors communicate all activity to the security control panel, even when the system is disarmed. 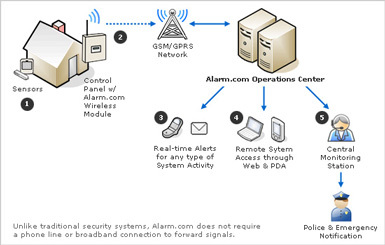 The Alarm.com Wireless Module transmits this data wirelessly (via the digital GSM network) to the Alarm.com Operations Center. Alarm and non-alarm events like door openings/closings, motion activity, power failures, system arming and disarming, etc. can be reported to you immediately via email and text-message, based on your customized notification settings. You can monitor and control your security system from anywhere via Alarm.com's web and PDA interfaces. In the event of an alarm, the signal can be routed immediately to the central monitoring station for 24/7 emergency response.